Gift helped charities tackle issues like child abuse, climate change and poverty. Their fundraisers stopped people in the street, gave them the lowdown on the cause they were promoting and encouraged them to donate by direct debit. They cared deeply and got their views across convincingly. They cut through apathy. 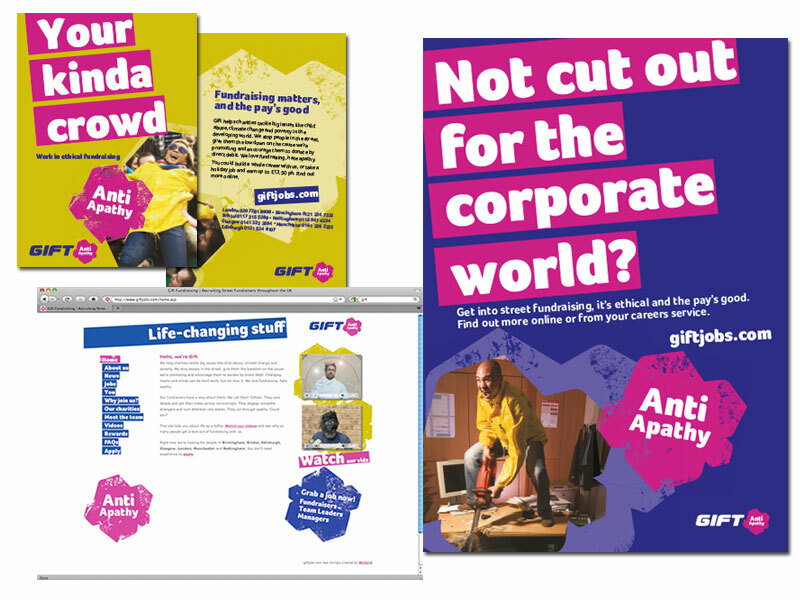 ‘Anti Apathy’ was the essence of Gift, and we turned it into a full-blown attraction and internal comms campaign. To some, charity fundraisers or ‘chuggers’ have to be the worse job ever! After all, you’re not altogether ‘popular’ if you are one, and let’s face it, most people will actually cross the road to avoid engaging with you. Some people will be a lot worse. So just how do you sell the prospect of a career where in spite of all of this, you are happy, confident, outgoing and above all, won’t give up because your success really does make a difference to those who most need it? We created a campaign plastered with ‘Anti Apathy’ stamps and strong supporting lines. Handmade videos highlighted the weird and wonderful things that go on in street fundraising. Filming had us drenching a Giftie’s barnet, capturing a gorilla, seeing a ghost, meeting Spiderman, dancing the conga down Archway and blushing deeply as one of their crew donned boxers, fishnets and stilettos. As well as a website, we proposed including posters, head-hunting cards and recruitment pack. Lively and cheeky, the campaign was Gift through and through and it went down a storm with its target audience: outgoing 18-24 year olds who cared enough about what happens in the world to want to do something about it. It also picked up numerous creative awards for us and the client to boot!